To start off I noticed my other was edited with new and x360 in the title so I figured I was supposed to do that and didn't realize so I added them this time. My bad if I wasn't supposed to do it myself. Now as to explaining it all, it's pretty straight forward. 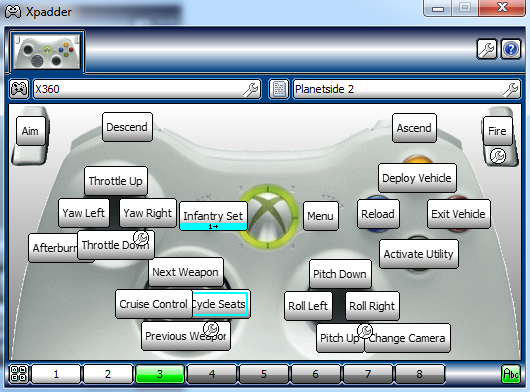 I assigned the back button to switch between the three sets, infantry going to ground vehicle, ground vehicle going to air, and finally air going back to infantry. If there's a better way to do this please speak up I'm rather new to the system. 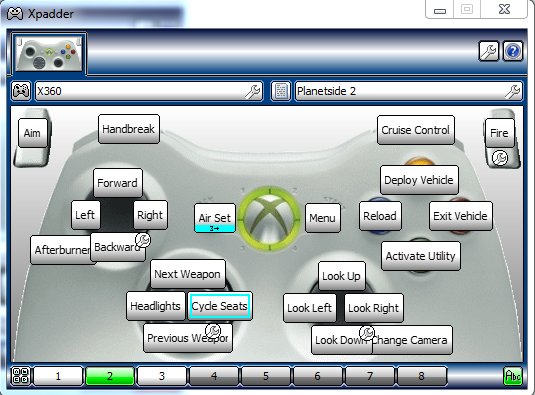 Also in vehicles I have right on the dpad switching through seats. Now it seemed to work for me but I only had two seats to switch between in the vehicle I was in so if it's working weird/not working in vehicles with more seats please let me know and I will try and figure out what the heck I did wrong. 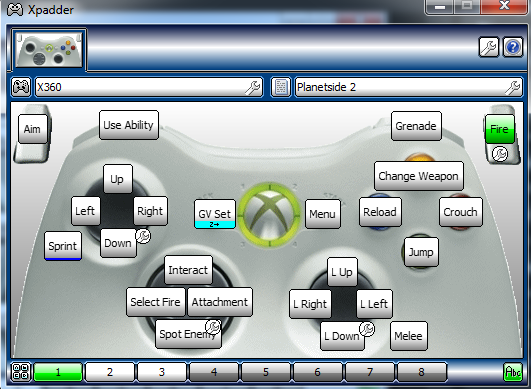 Finally as an aside the button to the bottom left of the left control stick and the bottom right of the right control stick are L3 and R3 respectively, in case that was confusing. Just moved them so they were readable. Last edited by GenLloyd on 16 Feb 2013, 16:09, edited 1 time in total. is the left shift+esc intentional on left thumb stick? fvelilla wrote: is the left shift+esc intentional on left thumb stick? I do not believe it was, so I went ahead and fixed that. Thanks for pointing it out. excellent. I've been testing it out and it works fine. I disable the lshift toggle for sprinting since the game have an option for spring toggle. it also cause conflict with other functions if you forget to toggle back off.